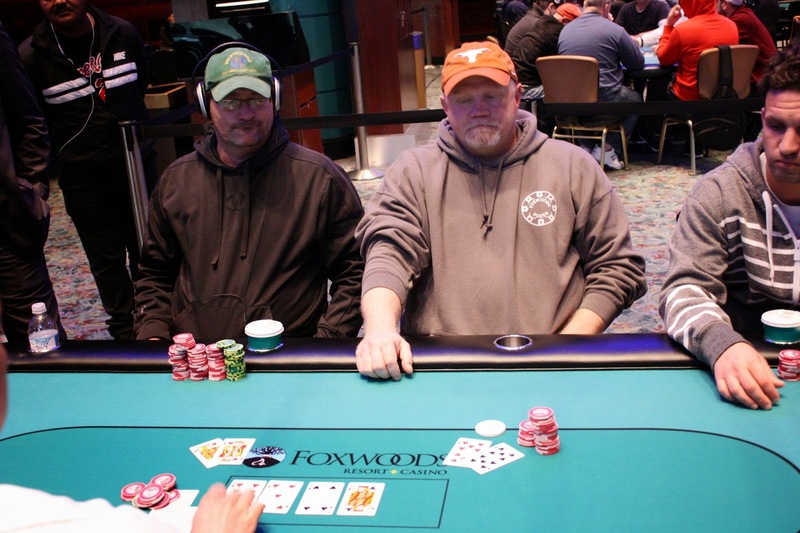 It didn't take long for heads up play to end, as Ray Hicks picked up a monster hand with [Ac][Kh]. 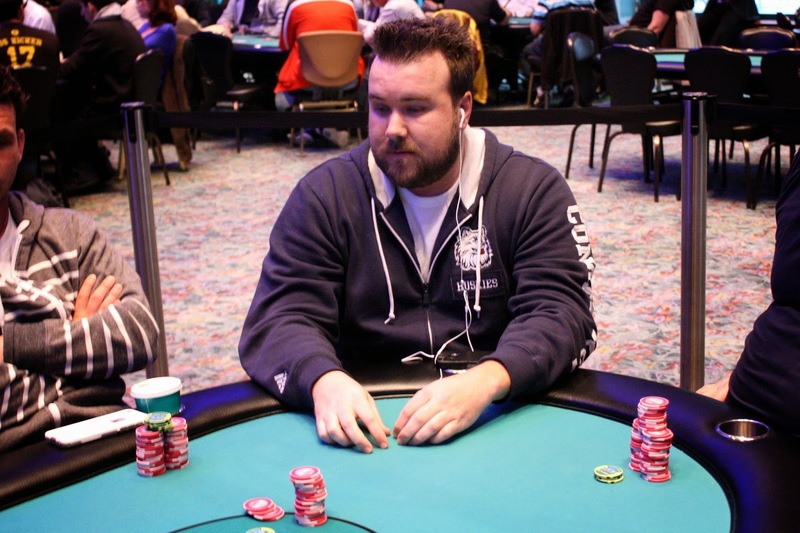 Unfortunately, Paul Brauer had picked up THE monster hand: [As][Ad]. Even though the poker gods were cruel, Ray had a big smile on his face as the two saw the [Ah][3d][6c] flop. Ray was drawing stone dead, and the turn and river fell [4h][8s]. 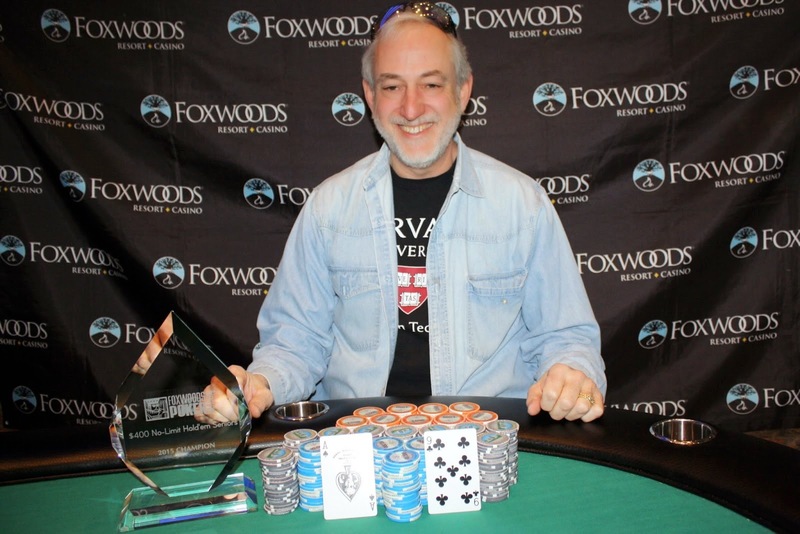 Paul will earn $14,985 for his 1st place finish, and will take home the Foxwoods Poker Classic trophy and title. Congratulations, Paul! 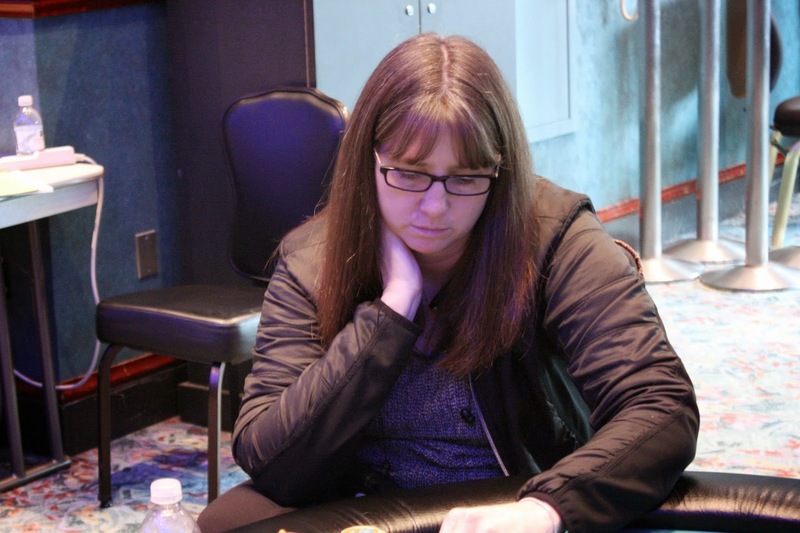 From the button, Karen Thielen moved all in for just under 300,000 and was called by Ray Hicks in the big blind. Karen had [As][3c]. but Ray had picked up a monster with [Kh][Kc]. 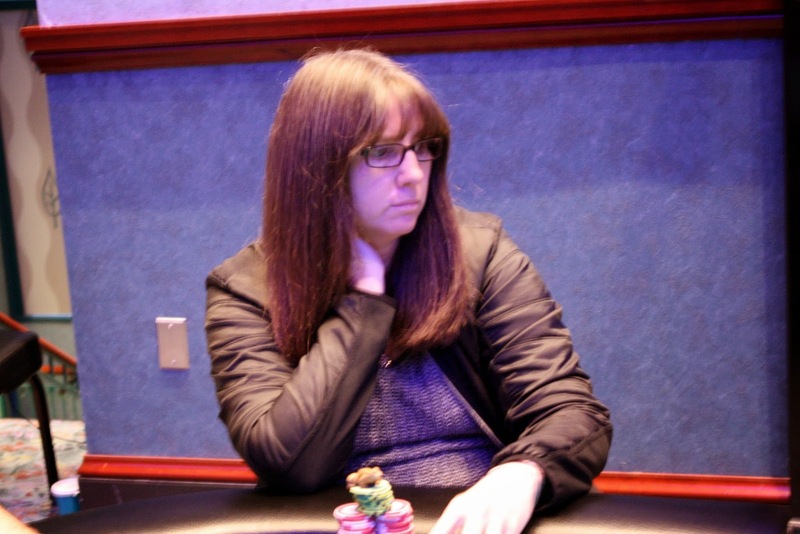 The [5c][8s][6h] flop was no help for Karen, but the [2c] gave her a gutshot to go with her overcard. When the [2s] hit the river, Karen was sent to the rail in 3rd place to collect her $6,542. 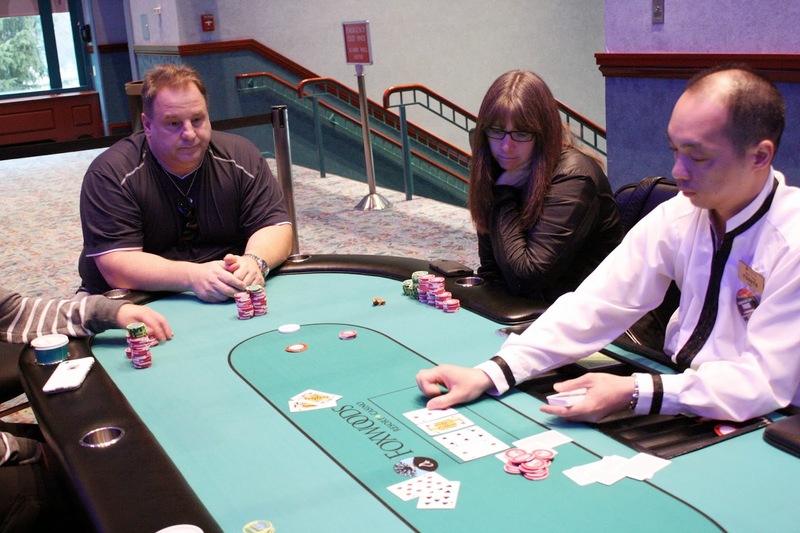 On what looked to be one of his last hands, Paul Brauer raised preflop and was called by Karen Thielen. The [Kd][3s][Ad] flop brought a check from Karen, and a c-bet from Paul. Karen called, but then bet out on the [9s] turn, which Paul called. On the [Td] river, Karen moved all in and Paul made the call. Karen had turned two pair with her [Ac][9c] to beat Paul's [As][Jc]. The stacks were counted down, and Paul was left with just a few blinds. The next few orbits were a flurry of all ins from Paul, which he won. On his most recent allin, Paul was sitting pretty with a set of threes with his opponent Ray Hicks holding just two overcards. Ray turned a gutshot straight but missed, and Paul now sits on 1,500,000, which is just over an average stack. Michael was amazed that his ace seven on the button was beat in two spots. He will exit this tournament in 4th place, good for $4,864. On a [3s][Th][9d][3d][3h] board, Bruce Barrett moved all in and put Karen Thielen deep in to the tank. She played back through the hand and eventually called. Bruce tabled [Ks][Jh] for jack high, and Karen will win the pot with [Kc][9h]. 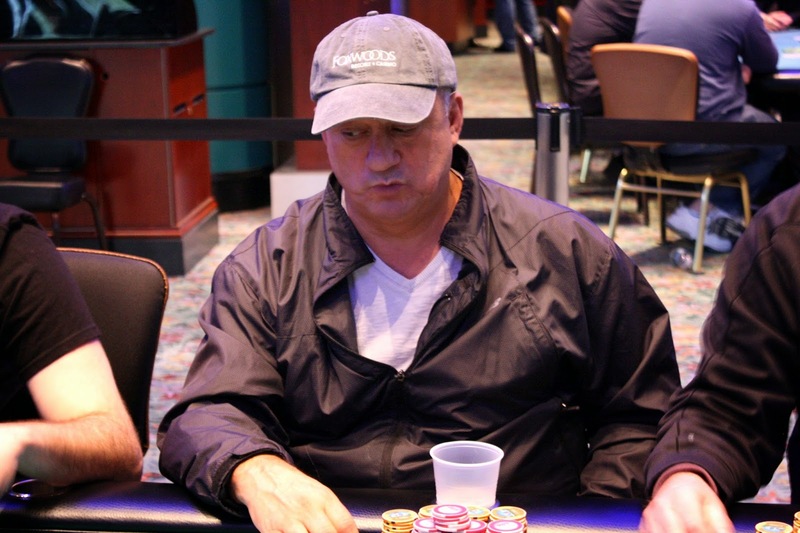 Bruce will be eliminated in 5th place, good for $3,690. Five handed, Ray Hicks got the last of his chips in with [Jd][Jc] and was called by Karen Thielen, who had a bit of a cooler with her [Ts][Td]. Ray hit top set on the [2d][6s][Jh] flop, and Karen failed to find her miracle quads as the turn and river fell [3h][Ad]. Ray will double up to 500,000. David Ives was all in with [2h][2c] and was up against the [Qd][Jd] of Karen Thielen. The [Kh][3d][5d] flop meant that David was a 42% underdog even though he had the best hand. That didn't last long as the turn fell the [Ad], leaving David drawing dead. 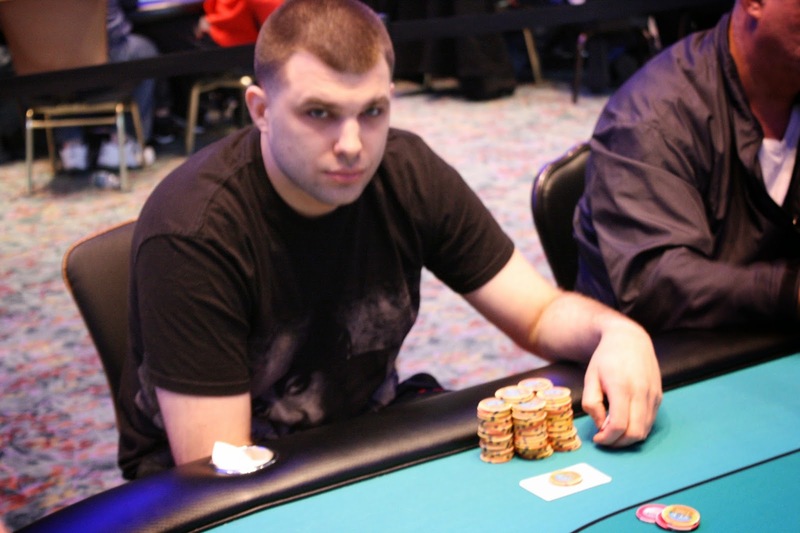 The river hit the [5h], and David will be eliminated in 6th place, good for $3,019. 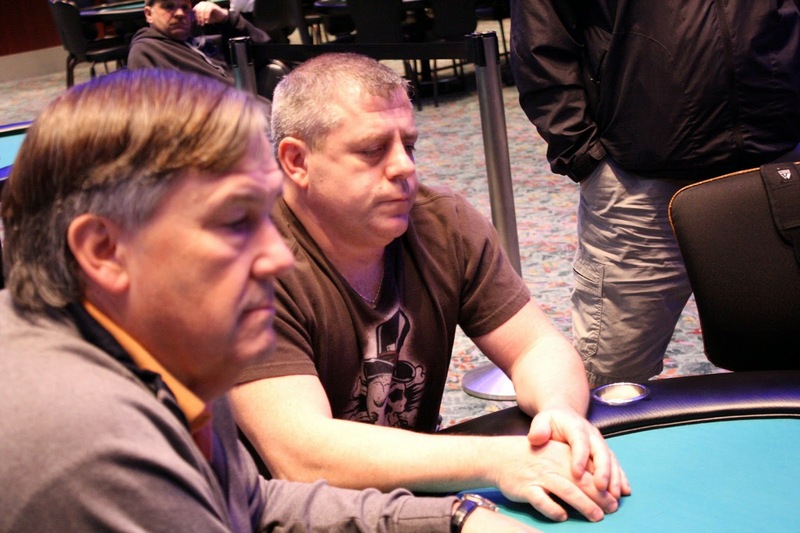 Mark Perry was all in with [Ac][7d] and had an uphill battle as he was up against [Ah][Th]. The [Td][9d][8s] flop gave Mark an open ended straight draw, but the [Tc] turn and [Qh] river wasn't what he needed. 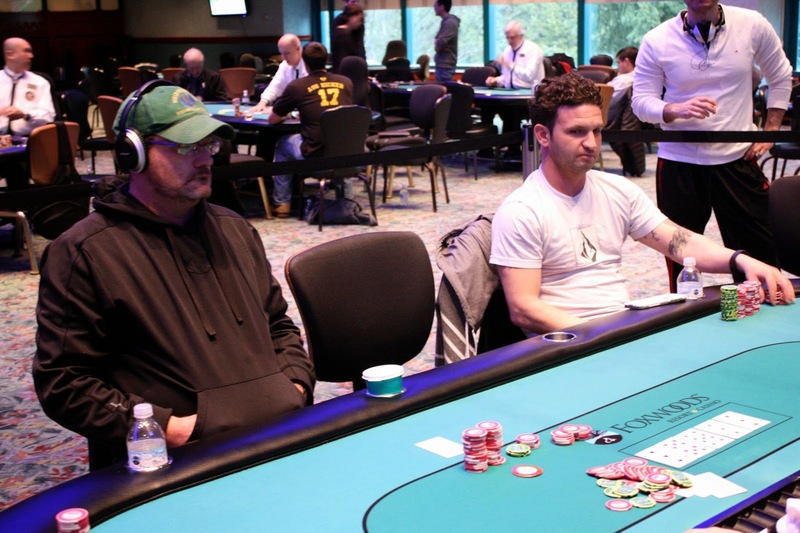 Mark will exit this tournament in 7th place and earn $2,460 for his efforts. 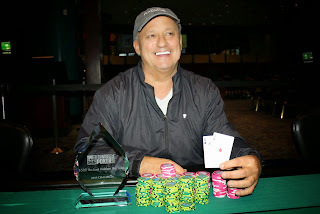 Rod Harper was all in preflop with [Ts][Th] and was flipping with his opponent's [Kh][Jh]. 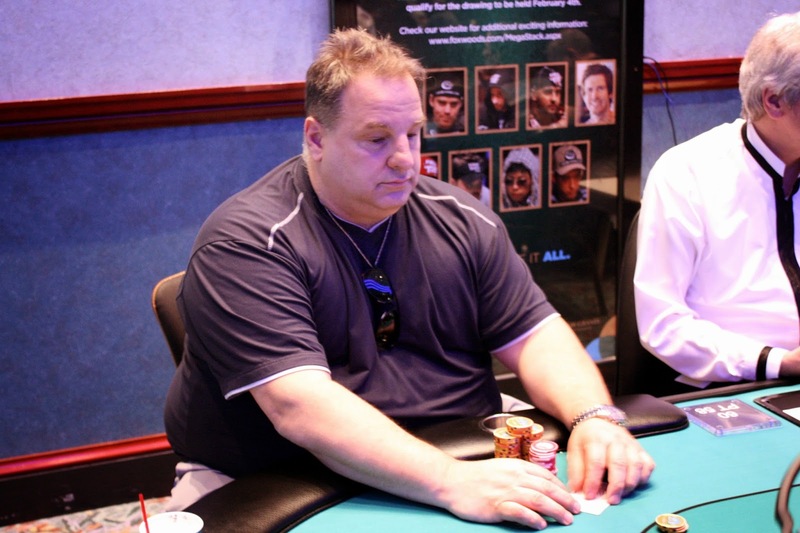 The [9h][5h][4s] flop was safe for Rod, but the [Jc] turn severely hurt his chances at survival. 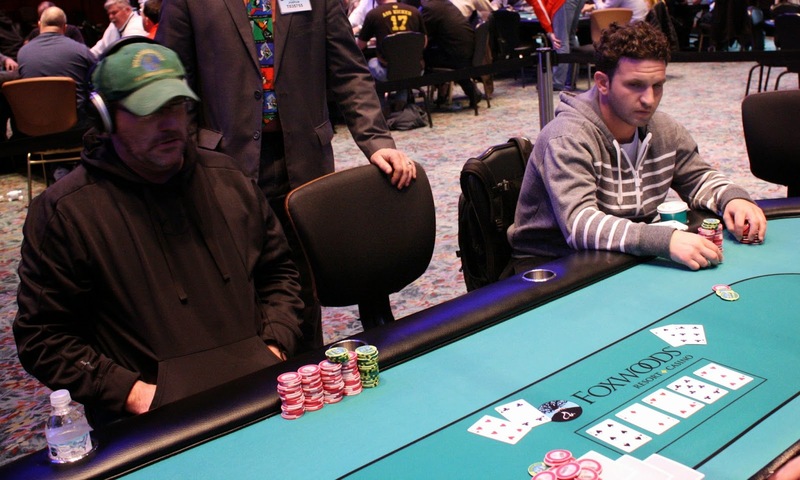 No ten hit the river, and Rod pushed his seat away from the table as he got up to collect his $1,957 for 8th place. Stephen Santoro was all in with [Kc][Qc] against David Ives's [4s][4h]. The board ran out [3c][5d][6d][3d][5c] to keep the pocket fours in front, and Stephen will be our 9th place finisher. He will collect $1,566 for his efforts. 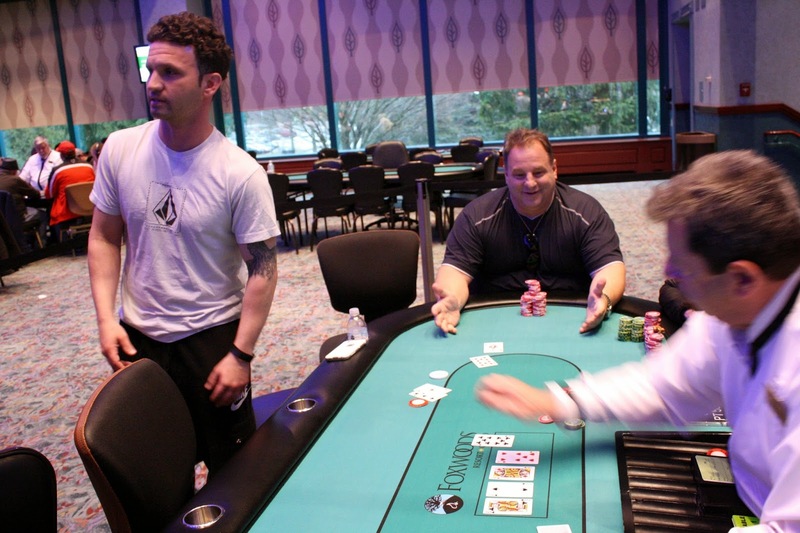 Nick Palma was all in with [As][7h] against his opponent's [Th][Td]. The [3h][7c][3d] flop paired Nick, giving him five outs to survive. But neither the [4s] turn or [5d] river could save Nick, eliminating him in 10th place. Nick will collect $1,230 for his efforts. $100 Bounty Chip must be on the table and visible at all times. Levels 1 - 15 will last 20 minutes / Levels 16 + will last 30 minutes.